As this year comes to a close, I wanted to talk about all the things we're thankful for. We started blogging almost a year ago, and we're so happy to have met all our wonderful friends! It's amazing how Mommy loves all of you kitties out there(and mommies, daddies and yes, even woofies!). 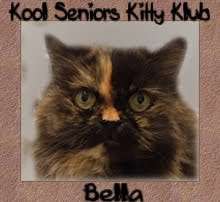 She said it's a great way to have more kitties in her life, without all the litter box cleaning! I think it's better this way too. I mean Samson and I take up most of the room in this place, and as much as I love all of you, I'm very happy that you have your own homes! 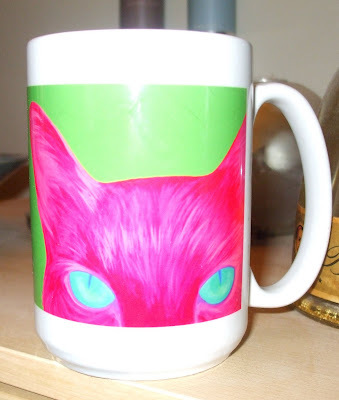 We got her a mug from The Creek Cats' Zazzle store with a design that their Mom Dana made on it. 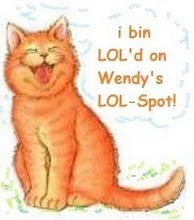 Now Mommy loves so many cats in the CB, that we would have to get second jobs (aside from being cute) to be able to buy her mementos of all her furry loves. Crikey pajamas, Isabella umbrella, a plush Fin toy, Sweet Praline fuzzy slippers, a Bugsy bathrobe, Tasha teacups...you get the idea. The list goes on and on. We're also thankful for all the other things like good health, each other, enough food, a warm place to live, and of course Mommy and The Ball Guy. We're even thankful for Sweet Pea. As much as she's terrorizing The Ball Guy with her kitten antics, she's also brought a lot of much needed kitty-love into his heart. We know he adores her, and that makes us happy. Now, just keep her over at your place, k Ball Guy? 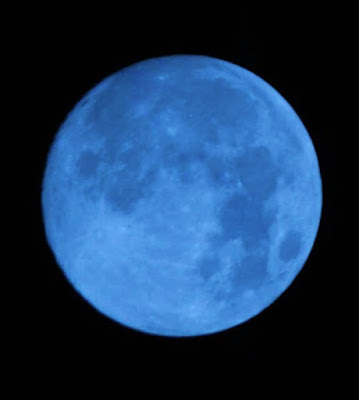 It's a blue moon for New Year's Eve tonight, and that happens, well, once in a blue moon! We wish you all a very joyous and safe New Year's Eve and a most wonderful 2010! Delilah and I have been so caught up in the all the festivities, and squabbling over whose toy is better, that we forgot the true meaning of Christmas - love! As Samson reported on Sunday, we received a lot of really great toys and treats from Santa. One of the toys in my stocking was this amazing catnip lemon. Samson was a little mad because I took his cigar for a test run. Really, it was just quality assurance to make sure it was up to par for him. Only the best for my Samson! I really love my lemon the best. It's what Santa chose for me! All this nip is tiring me out. Christmas is the best! Oops! 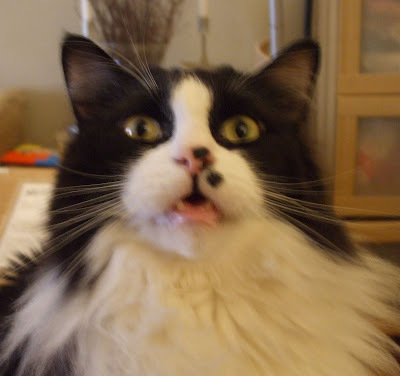 It wasn't very supermodel-like to yawn. I'm very concerned because I've found my evil twin, and he's living in the same city as me! 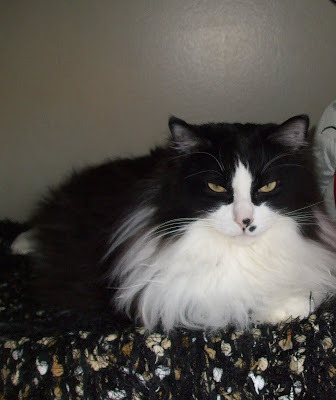 A co-worker of Mommy's was walking by our friend Jenn's desk while she was checking out my blog, and he noticed that I look like his cat, Jesse! Of course, Mommy wanted to see pictures of 'Jesse' (if that is, in fact, his real name) to see how much he looks like me, and she agrees that he is my doppelganger. I have to admit that he's a handsome fellow. He's even got one of my Sharpie dots in exactly the same spot. But friends, please don't be fooled by his gentle appearance - that's exactly what he wants! Evil Samson's Dad claims that he's sweet, affectionate, great with his kids and an all around good cat, but if you're a Star Trek fan, you may remember an episode where Spock has an evil twin. The only difference in appearance was the telltale goatee. Evil Samson has a beard, which proves that he is from an alternate universe, and because I'm very good, he must be evil. I'm worried that Evil Samson will use his charm and good looks to do harm. I hear he's already terrorizing and brutally murdering mice and chipmunks in his own neighborhood. Sweet and affectionate? Hardly! Although I do not have exposure to live mousies, I assure you that if I did, I would murder them with love and respect, not like the callous-hearted Evil Samson. Who knows what Evil Samson may be planning? I want the world to know the subtle differences in our faces, so that if he tries to fool you into thinking he's me, you'll be aware of his trickery. If you see Evil Samson, do not approach him! He is armed with incredible handsomeness and should be considered extremely dangerous. My eyes are on him, and as soon as he makes the wrong move, I'll expose him for the vicious sociopath that he must truly be. My plan to make sure Santa came to our house worked! We were going to wait until Monday to post, but I am too excited! Despite Mommy's best efforts to squash Christmas, it still happened. I even think I saw Santa, although it was the middle of the night and it could have been Mommy in her big, red housecoat shuffling to the bathroom...but I woke up to this! Sweet Pea came over with The Ball Guy and this time we had the Feliway diffuser going, so it was a lot more harmonious than previous times. 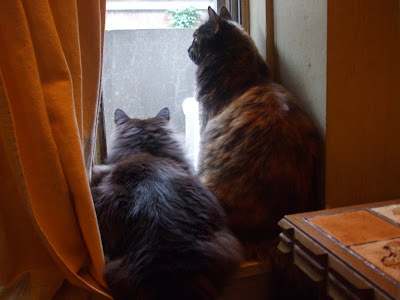 Although the girls did have one or two stand-offs, but that's to be expected with two Torties! Now I've got to protect this lemon with my life! You know how easily women change their minds. I don't want the cigar now, anyway. Delilah already drooled all over it! And she LOVED the jellybeans that Jane and Alice sent for her. We had a great Christmas, thanks to me! 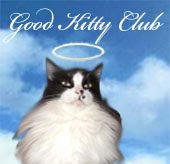 Last week, a very dear friend of ours (and of the whole Cat Blogosphere) unexpectedly passed away - Callie from The Kitty Krew. 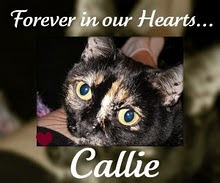 Callie was a Tortie, like me, and like all my other tri-color sisters, she was a wonderful, strong girl. 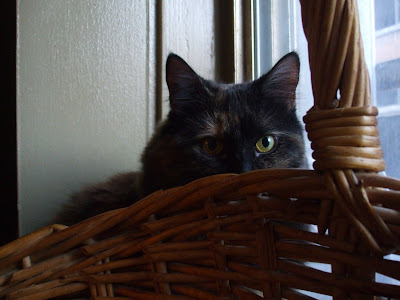 We will miss her very much, but we know she'll make an excellent Tortie Angel. Santa is coming to town in a few days, and I'm worried that he's going to skip our house! I've been very good. 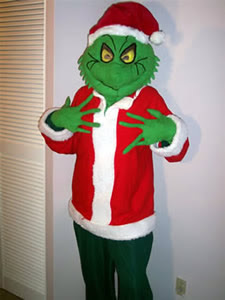 In fact, I think this year is my best chance for getting on the 'nice' list. It's the girls in my life that I'm concerned about. Deli has definitely been naughty. I've tried to gently urge her to clean up her act before the big man comes to town, but she just whaps me. One look at her and Santa is going to run screaming! Sweet Pea has not been much better. I realize she's still a kitten, and this is her first Christmas ever, but look what she did to The Ball Guy's arm! If you biggify it, you can see the puncture wounds as well as the slash wounds! He was laughing when he showed Mommy, but I know if I did that, it'd be straight to the naughty list for me. 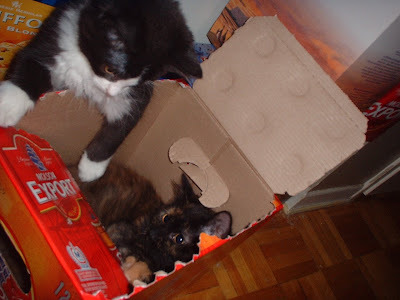 Delilah and Sweet Pea are Torties, and Mommy says that Santa understands tortitude, so maybe they won't scare him away just being themselves. Mommy, on the other hand, is NOT a tortie, and she is the worst of all the girls around here! She hasn't put one stitch of Christmas decoration up, and says she won't either. She has to work during the holidays (from home) and she said she just doesn't have the time. I guess it's up to me to save Christmas, so I've come up with a plan. Mommy says that children, doggies and kitties usually leave out sugar cookies and milk on Christmas Eve, because Santa has a lot of work to do and needs some nourishment for energy. I've decided to leave him treats and a mousie instead. These treats are full of protein, and instead of a quick sugar rush, he'll have more energy for the long haul. The mousie is, well, no explanation needed. Everyone loves mousies. And who wants sugar cookies when you can have freeze-dried beef liver and chicken??? Not Santa, I'm sure. I'm also going to leave out stockings. Since we have no tree or Christmas decorations this year, at least Santa will have a place to put the gifts. The little one is Sweet Pea's because she's so small so she will probably get tiny gifts too! 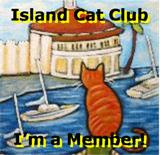 If any of you 'nice' kitties have any other suggestions to lure Santa, I would love to hear them. I'm working with some very naughty housemates here, and I need all the help I can get! P.S. We were so sad to hear about our friend Callie leaving last week. We are sending purrs to her family in this hard time. 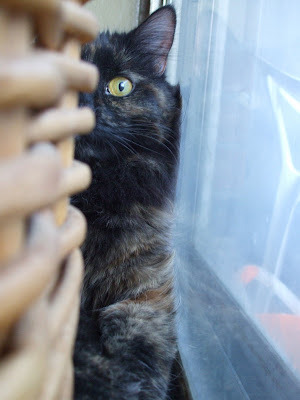 Delilah is going to dedicate her Tortie Tuesday tomorrow to her tortie friend. Sweet Pea wanted to get in on the Hunt Week fun proposed by Fin. She's only 11 weeks old, and still a little wobbly, so she started off hunting snowflakes. Once she felt she had conquered snowflakes, she decided to go for some bigger game; The Ball Guy and his camera. We put together a little compilation video of her best moves. 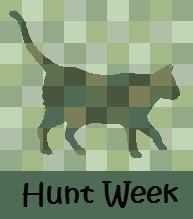 Our extremely inventive friend Fin has named this week Hunt Week, so I definitely wanted to participate! 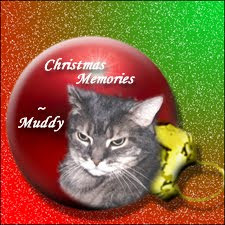 The wonderfully talented Ann from Zoolatry made this amazing Christmas ornament of Mommy's former Mancat, Muddy. Muddy died in 2006, shortly before Delilah and I arrived here. 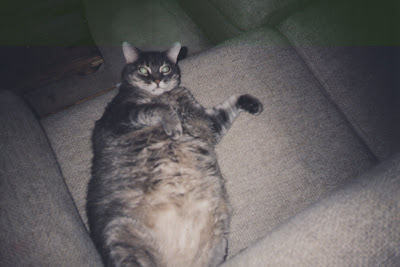 I'm kinda glad he isn't here anymore to compete for top Mancat in this house, because I saw some pictures of him, and he was BIG! Even if I ate extra treats, every day for the rest of my life, I could never get as big as The Mudman! There's no way Mommy's gonna get away with calling me chubby again after I saw that! Hey Mom...how about some more treats? I'm skin and bones over here.